It seems that as you get older it gets harder to eat well. All of the healthy food that used to be part of your day gets farther and farther away. Instead of picking the apple for an on-the-go snack, you grab the chips. You’re not alone, but we can help you make small changes that will equal a big difference. This might seem obvious, but stop buying the junk food and start buying those beautiful multi-color fruits and vegetables.They are much better for you and can satisfy your craving just as well as that cookie. Find a bowl that you can keep on the counter – in plain sight of everyone. Chances are that if you keep it where people see it they will grab a fruit instead of a candy bar. To make the vegetables more convenient, cut them up and put them in snack bags in your refrigerator. Dedicate a crisper or even a storage container for these snacks. You’ll eat more if you do this one step. Another easy way to add more vegetables to your life is by dicing them up small or chopping them up in a food processor and adding them to sauces, soups or casseroles. Are you making spaghetti sauce? Add green peppers, red peppers, yellow peppers, onions, mushrooms, and tomatoes. That one meal was just given a huge flavor and nutritional boost! If you kids absolutely hate the taste of vegetables another way to get more in their diet without a lot of hassle is by pureeing them and adding them into recipes. You can find cookbooks that have recipes if you’re not sure how to do this. Kids love smoothies and shakes, so this is an easy way to add them. You can even add spinach! It’s undetectable in the right amount. This alone can get you a full serving or more of fruits and vegetables. If your kids turn their noses up – name the smoothie. A green smoothie can be called a Superhero Smoothie. This smoothie is special though – it is only for superhero’s that are compassionate and funny. Of course, you’ll want to pick a few traits your kids have. Cooking your vegetables different ways produces different results. You might not like brussel sprouts, but don’t assume that you don’t like them at all. Try steaming, baking, grilling and even eating them raw in a salad. You never know until you’ve tried all ways to cook and prepare them. Use any of the tips above and you’ll notice you’re eating much more vegetables throughout the day. Make it as easy for yourself and your family as possible. 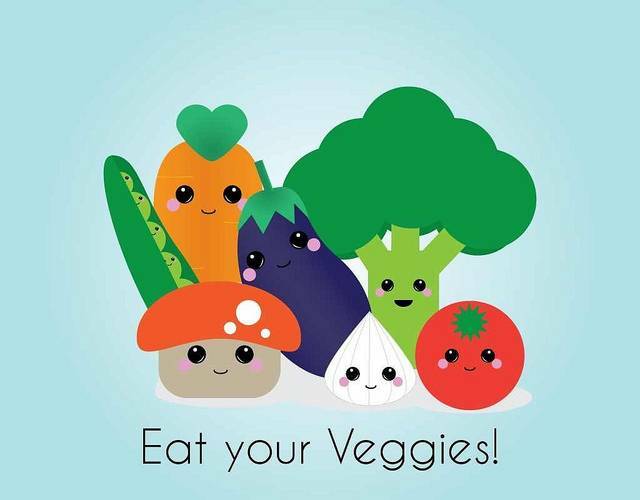 The easier it is the more likely you’ll pick the vegetable and fruit over the junk food! You can use whole grains in a variety of ways and there are different grains to choose from. You’ll notice grains have a lot of versatility. This includes the way you use them and cook them. One of the best ways to start making whole grains a daily part of your diet is to substitute whole wheat bread products for refined. You can find whole wheat in many items that you use now – bread, hot dog buns, hamburger buns and tortilla. Make sure they all say 100% whole wheat. Kids really love English muffins and pita bread, so those are good options to start switching right away. Instead of using all whole grains in your cooking you can use half when you first get started. This works extremely well for flour and pasta. If you really need to get accustomed to the taste, then use even less than that. Did you know they also make a whole corn meal? Use that instead of the regular corn meal. It can be used in corn muffins and corn bread. There are many different types of rice, so don’t be limited to just one – wild rice, brown rice (short, medium and long grain), sweet rice, black rice and red rice. Cooking whole grain rice takes significantly more time than refined rice.You can cook it on one of your days off or buy a pressure cooker to cut your time in half (or more!). Cook a big batch and freeze it. Then when you are ready to use it take out a little at a time. When freezing don’t freeze it all in one bag – use small bags and measure them out. Then put all the little bags in a bigger bag so that you can easily find them. You might be thinking that oats are a breakfast food, but you can use them in multiple ways. By adding oats to recipes you’ll get more whole wheat in your diet. You can even do it so that no one is the wiser. Blend the oats into your recipes that have meat – like meatloaf or meatballs. Add it to your yogurt. Usually you’ll have to add it for a few hours, so that the oats are soft. Smoothies are a good way to get more oats. Either soak them for a little while or put them in your yogurt before you add it to the smoothie. Put it in your soups. If the size and shape of the oat doesn’t work in your recipe, put the oats in your food processor and blend it up. Oats will bulk up the soup and make your family full. Quiona might be a good option because it is full of health benefits and is probably the least likely to cause comments from your family. Just make sure to read the directions on how to prepare. Other options are spelt, bulgar, barley, millet and wild rice. You can add these easily to food you already cook. Add a little at a time until your family grows used of the taste and textures of them. Add barley, brown rice, or wild rice to soups. Adding these ingredients will help you get full quicker and stay full longer. You might not think that your family will ever like the taste of whole grain, but if you don’t try you’ll never know. Whole grain provides important vitamins and nutrients to the body, so it is worth slowly adding these to your diet. Eating more fruits, vegetables and whole grains takes commitment on your part. Start buying more of the healthy stuff and less of the junk food. If your only option is an apple or nothing at all – you’ll likely pick the apple. Take a few tips from above and give it a try. Today you’ll be thinking about how you want to include fruits, vegetables and whole grains in your diet. Slow is the best way. Add ingredients to your grocery list for your next shopping trip.